Entering Wadi Salam is a very emotion place for many; however it carries extra significances for me. We entered the vast cemetery spanning miles from each direction, late morning, before the heat was to strong. It’s customary to visit the Prophets Saleh and Hud who are buried in Wadi Salam. These prophets are there to remind us of many aspects of life, and one aspect is our inevitable departing from this world. Wadi Salam is a very calm place, and the peace you feel with in this location cannot be experienced in any other location. When you sit under the shade outside the graves of these two prophets, you can feel the power of the Allah and His Majesty, from the simple breeze of the day wind that curses your face. 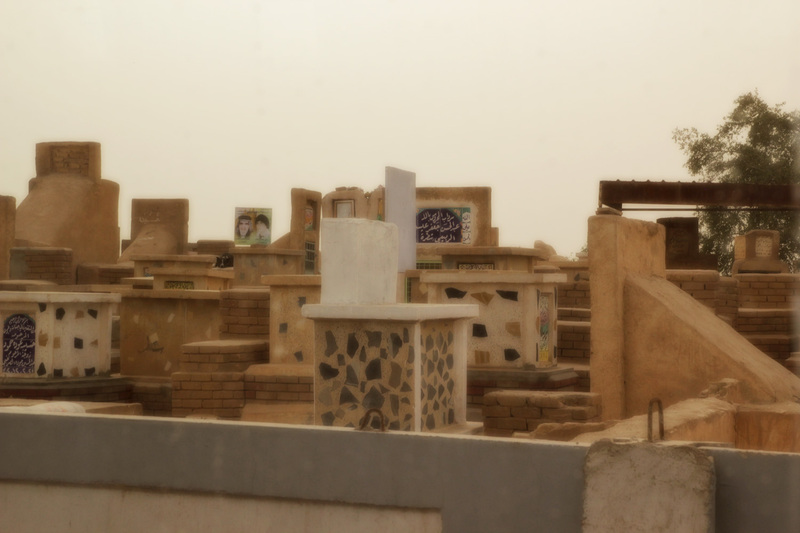 When you look beyond the ocean of tall graves marking someone’s beloved mother, father or child, you come to a realisation that you must admit no matter what. We will all leave this world! Eventually we must take the final journey to the final and most important place in our long journey in the scheme of things. We forget that we are guests in this world, and that this world has many trappings and if we are not careful we can fall for these trappings and waste the short valuable time we have been given on matters that are not beneficial for our final journey. I remember the story told to me once by very great Alim. Prophet Khizr was with his companions and they entered a cave so dark that none of them could see the other. They felt an unusual material under their feet, they enquired from Prophet Khizr what it is. He replied that it’s something, that if you pick it up you will regret it, and if you don’t pick it up you will regret it as well. Confused, some companions picked up some of the material and other half didn’t pick it up. When they left the cave and came into light, Prophet Khizr told them to open their hands and see what they had picked up, it was pure gold! Prophet Khizr explained to his companions, when we leave this world, some of us will have some good deeds to take with us in our hands, and some won’t have any! Those who have good deeds will regret why they didn’t take more and those who go empty handed will regret why they are empty handed. Which one will we be, those who are empty handed or those who have managed to accumulate enough to be accepted into gardens where rivers flow. Wadi Salam is not a scary place, but a part of every believers heart. It moves you so much that you don’t feel fear of Allah to become good, but you feel the Power of Allah, His Greatness, His Mercy and Compassion overwhelms you into realising that you need to be better. You need to cut some of the control the world has on you and be free. Free from desire, free from need of loving anything more than Allah, our Creator, the One Who will never leave you alone. The One Who is there when your family bury you and leave you, the One Who is there when you are sick, and when you are hurt, when you are happy, when your heart is broken and when you are seeking something. Allah you say to us you are closer than our own jugular vein, and yet we close the eyes of our heart to you, why? Why do we look in other places for love when you are most loving, why do we look for acceptance in other places when you are the most accepting? You give us all we ever need and we never thank you, you save us from our own mistakes and yet we never acknowledge Your Majesty and Compassion. Wadi Salam is it possible one day I can be buried within your holy land? Near my forefathers, and my master. The one who was the living Quran, the one who was patience, love, compassion, mercy, knowledge and power personified! The one who after the Prophet of Islam (s), Allah said he created humanity for.